Back when I was at my heaviest, I rarely set foot in the kitchen so I had little control over how my food was prepared. So when I set out to reach my Feel Great Weight, I made a vow to get more comfortable in the kitchen—and not just with the microwave. Cuisinart Elite Collection 4-Cup Chopper/Grinder: This grinder is the best little gadget! It's perfect for chopping extra veggies to throw into soup, an omelet, or casserole. But it's also great for making my favorite low-calorie treats, like yummy, high-protein Almond Joy "Ice Cream". I actually like this version better than real ice cream and it comes with a fraction of the calories and fat. Old-fashioned oats: I eat old-fashioned oats almost every day—either for breakfast in a big bowl of oatmeal or as a snack, like in my 3-Minute Oatmeal Raisin Cookie. Old-fashioned oats are delicious and so satisfying, thanks to the 3 grams of fiber and 5 grams of protein in each 150-calorie serving—and a little goes a long way! I'm never left wanting more after eating oats. Teddie Peanut Butter: Where would my life be without peanut butter? Teddie is all natural and tastes just like smooth, ground peanuts. Even though peanut butter is relatively high in calories, Teddie Peanut Butter sticks to my ribs and keeps me full for hours. It's worth the calories for the serious satisfaction factor! If I add a couple of spoonfuls to my morning bowl of oats, I'm not hungry until lunchtime. Mario Batali Measuring Prep Bowls: These bowls have measuring cup numbers on the inside, so it's easy to keep track of portion size—especially with high-calorie treats like ice cream. Plus, their small size makes snacks seem much more plentiful when they fill up the small bowl. In the end, I eat less, and the number on the scale stays the same. Cuisinart 12-Cup Coffee Maker: Iced coffee with vanilla soy milk pretty much tastes like dessert to me. It's the perfect low-calorie treat to satisfy my sweet tooth and it tastes so delicious on a warm, spring day. 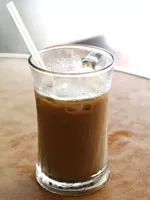 And, of course, an iced coffee is a wonderful pick-me-in in the morning or mid-afternoon. What are your figure-friendly kitchen essentials?